Danube Day 2019 will be bursting with inspiring events! Details of new cross-border and basin-wide events will be posted here in June 2019. Danube Day events inspire people, communities and countries to work together across borders. They encourage people to look beyond their national boundaries and consider the multitude of peoples living in the Danube Basin. Across the region, governmental, non-governmental and private sector organisations are working together to make the 16th Danube Day the best yet. The scale of Danube Day 2018 was huge, with ambitious basin-wide and cross-border events, as well as national celebrations, regional actions and village festivities. The programme included river fairs and clean-up actions; conferences and awareness raising activities; aquatic and sporting challenges; leisurely cruises and fun youth events. 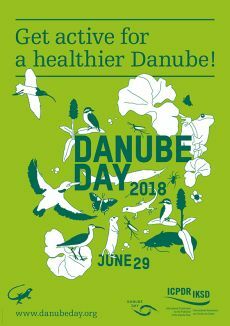 Many events encouraged riverside communities to share Danube Day with neighbours across borders: getting active for a healthier, shared Danube! Read the 2018 Review to find out about the international events that took place in 2018, or view the national pages for more details. You can also read about the thousands of events and partners involved in previous Danube Days on the general Review page or contact your national coordinator for the latest news.